Infineon offers the EVAL_2500W_PFC_GAN_A demo board showing a high-efficiency PFC stage, which exploits the advantages of Infineon’s CoolGaN™ technology to boost the system efficiency above 99 percent for efficiency-critical applications, such as server or telecom rectifiers. One unique advantage within the enhancement-mode (e-mode) GaN semiconductors is the complete absence of any reverse recovery charge. Therefore this technology enables new topologies in power classes that cannot be addressed by today’s HV superjunction (SJ) power semiconductors. Based on these features, the totem-pole PFC topology is the perfect match to exploit the benefits of Infineon’s CoolGaN technology. This demo board shows reliable operation up to 2500W with benchmark efficiency of 99.2 percent. To achieve this, only two discrete 70mΩ CoolGaN switches in combination with two discrete 33mΩ 650V CoolMOS™ C7 Gold switches are required. All power components are surface mount devices enabling a faster and cheaper assembly process. The control is realized with Infineon’s standard ICE3 continuous conduction mode (CCM) control IC. The pwm switching frequency is set to 65kHz. The totem-pole PFC is an ac-dc converter concept that replaces all diodes along the current path with semiconductor switches. In this way it is possible to increase the overall efficiency of the application as the voltage drop of the diode is being mitigated by the resistive behavior of the power semiconductor switches and the lower number of conducting devices in an on-state. This PFC works in CCM, meaning the input current is commutated between transistors Q1 and Q2 depending on the duty cycle. This has the advantage that the input current ripples are significantly reduced compared to discontinuous current mode (DCM) operation, so a better power factor and a better THD factor can be achieved by CCM operation. This mode of operation is also called “hard-switching”, as the commutation is performed with a positive load current across the transistors. 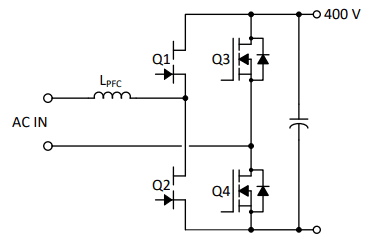 This raises the requirement for rugged transistors suitable for commutation that do not suffer from reverse recovery issues. GaN High Electron Mobility Transistors (HEMTs) with zero recovery charge are therefore the perfect choice for this application. The absence of Qrr also reduces the turn-on losses; the cross-over of voltage and current is minimized because the device can be turned on faster. In contrast, soft-switching applications (such as LLC and ZVS) perform the commutation at zero current – or zero voltage – conditions. The phase rectification stage consisting of Q3 and Q4 is realized by two SJ 650V CoolMOS™ C7 Gold devices offering a low RDS(on) (33mΩ) in a TOLL package. This latest generation of CoolMOS boosts the efficiency and, as these devices are switched at the zero-voltage crossing, power semiconductor devices with non-zero Qrr values can be accepted (ZVS). For details about this device please refer to the IPT65R033G7 datasheet.